The problems associated with microplastic pollution are less obvious and often harder to appreciate than the obvious effects of larger plastic pieces in the ocean.  It is even harder to communicate to the public effectively about issues that scientists do not fully understand. The challenge is to convey both the current and the potential extent of the problem in a way that will make people care, without overstating or speculating unreasonably beyond the current data. This review looks at the issue of microplastics, namely where they come from and what problems they cause to marine life. Whether it be a turtle with a plastic straw being extracted from its nostril, a baby albatross whose stomach is filled with pieces of plastic, or a seal with its head grossly constricted by a piece of fishing net (Figure 1), many of us have by now seen the heartbreaking footage or photos of animals suffering the consequences of plastic pollution in the oceans. Such strong emotion is provoked by these scenes because of how visibly uncomfortable the animals appear. People can empathise with them; they can on some level relate to their pain. However, it is much harder to empathise with a tiny copepod ingesting a barely visible microplastic particle (Figure 2), and yet these encounters are potentially as ecologically significant as the turtle’s, the albatross’ or the seal’s. Microplastics are defined as pieces of plastic less than 5mm in length. They come into existence by several routes. First, there are primary microplastics – plastic pieces that are originally manufactured already at these small scales. The main example of these are microbeads which are found in various toiletries. There are also secondary microplastics, which arise from the break-down of larger plastic pieces. As the majority of plastic produced industrially consists of pieces larger than 5mm there has been much research into the mechanisms of degradation, and the formation of these secondary microplastics. The degradation of plastic pieces is initiated by UV-B radiation from the sun and then continues oxidatively. So if one thinks about the conditions that would speed up or slow down this degradation, light intensity and oxygen availability are important factors. Added to this is temperature, because a higher temperature will lead to higher rate of reaction between the oxygen molecules and the plastic. Therefore, larger pieces of plastic do not actually degrade at a very high rate once they are in the open ocean, because they often sink which means the conditions become darker and less oxygenated. The highest rate of degradation is on beaches. Here, pieces of plastic are generally in areas of high UV-B intensity (broad daylight), exposed to a high level of oxygen in the air, and are very hot due to the low specific heat capacity of sand (a quality which is hard to ignore when hopping down to the beach towards the sea on holiday). Another important factor is surface area: when a piece of plastic begins to break down it will form cracks and fissures which increase the surface area that is exposed to air, so more reaction sites can form with oxygen and the piece breaks down faster. Firstly, this highlights how careful everyone needs to be with plastic litter on the beach, and secondly, how important beach clean-ups are in the effort to deal with this problem. It takes just a moment to pick up a piece of plastic and put it in the bin. This small moment could prevent thousands of plastic pieces entering the sea. Microplastics have been shown to be ingested by various marine animals and often have negative effects on the animal’s survival. Zooplankton such as copepods form the second trophic layer of the marine food-web, eating the primary producers: the photosynthetic phytoplankton. Being so near the base of the marine food-web means that zooplankton are very important as virtually all marine life that occupies higher trophic levels depend on there being a strong supply of them. Cole et al. (2013) showed that, similar to larger organisms getting tangled in larger plastic pieces, microplastics can stick to the outer body parts of copepods such as their legs. They also showed that the copepod Centropages typicus can ingest microplastic particles and that this reduces their feeding rates. Similarly, Wright et al. (2014) showed how the lugworm Arenicola marina can ingest microplastics which subsequently reduced their energy reserves, increased inflammation and decreased feeding activity. Usually, A. marina has food continuously entering and exiting its body, but microplastics stayed around much longer in its digestive tract implying that the animal wasted lots of energy trying to digest the pellet. A. marina is a keystone species, meaning it has a disproportionate impact on the environment around it relative to its size and abundance. This is because it bioturbates the sediment that it dwells in, which helps to maintain the biodiversity there by mixing around organic matter, nutrients, and microorganisms. Wright et al. estimated that, based on the results of their experiments showing that microplastics reduced feeding activity by 25% in A. marina, in the Wadden Sea microplastics could result in 130 m3 less sediment being mixed around annually. This could have serious implications to the biodiversity within the marine sediment there. Another concern with microplastics, aside from the negative effect of the plastic itself, is the chemicals added to them in their manufacture, and also their ability to attract and concentrate chemicals when they are in the marine environment. Hydrophobic chemicals are very attracted to hard surfaces when they are in an aqueous environment, and so microplastics concentrate them on their small surface. These chemicals can include endocrine disruptors such as PCB (polychlorinated biphenyls) and DDTs (Dichlorodiphenyltrichloroethane, the insecticide made famous by the book Silent Spring). Endocrine disruptors have two modes of action: they can mimic hormones or block hormone receptors, and so can affect hormonally regulated processes such as the reproductive system. However, the mechanism of transfer of these chemicals is complicated. The relative importance of microplastics as a vector for the transfer of these chemicals, although more research needs to be done, could be relatively trivial. The reason for this is that for these chemicals to move from the surface of the plastic into the body tissue of the animals, there needs to be a fugacity (concentration) gradient between the two. In many cases there is in fact an equal concentration of the chemical in the body mass of the animal compared to the plastic, because these chemicals can enter the animal through different pathways and both the animal and the plastic particles are in equilibrium with the surrounding water. In these cases, there is no transfer into the animal, and sometimes, when the microplastic is a virgin pellet, there is even a cleaning effect because the plastic is cleaner than the tissues of the animal. More research needs to be done; it is a daunting task to determine exactly the extent of the risk that microplastic-associated organic pollutant transfer poses to marine health, as it will vary between species (for example seabirds, which have less consistent exposure to polluted sea water, will probably provide a higher gradient for transfer) and the physical properties of the plastic particle. Another way that microplastics can impact the marine environment is by being a vector for organisms to travel on. One might be surprised that something so small can be a vector in this way, but microorganisms can attach to and live on the surface of microplastics. Organisms attach to a variety of substrate and travel around the sea this way, but the way plastics get distributed is different from their natural alternatives. Plastics are a new substrate for small organisms to use in their life cycle. Furthermore, they do not degrade like natural substrates do. This means they can travel further without breaking down, so microorganisms can develop and breed and so if the piece of plastic lands in a new area there is a higher probability that the population will survive and persist in the new area that it is foreign to. So, microplastics can contribute to a mechanism for the spread of invasive species. It can be seen then that, although the exact intricacies of this complex situation cannot be fully explained yet, microplastics are a problem to the marine environment through their ingestion, through the potential transfer of chemicals associated with them and through their providing a new substrate for rafting organisms and transport of invasive species through this. More research must be done to accurately assess the extent and exact nature of these effects, besides many more. Lots of the studies mentioned are done in laboratories; there have been much less data collected within the marine environment itself. It is up to the generation now entering the world of scientific research to take up the plastic mantle and work out the exact nature of this issue so accurate and informed solutions can be made to protect the incredible life within our oceans, whilst also reaping the benefits of the extraordinary invention of plastic. Richard Thompson, who coined the term “microplastic”, has observed that the issue of plastic pollution is a “press” rather than “pulse” disturbance. These are ecological terms which mean that rather than being an immediate, highly noticeable catastrophe such as an oil spill, which has a significant but relatively temporary impact, plastic pollution is less immediately noticeable but its effects are more permanent. An implicit extension of this scientific definition is that people care more about pulse disturbances. It is easy to be outraged, shocked and motivated by such images and footage that came out of oil spills like at Deep Horizon in 2010 (Figure 3). 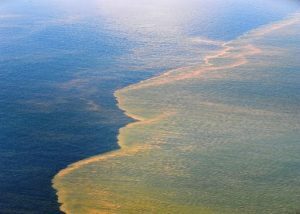 The oil spreads across the ocean like an infected scab – and people are impelled by the sight of it to tend to that scab. Microplastic pollution does not have such a visible wound. It could be argued that microplastic pollution is even less emotive than the larger visible plastic pollution. It is easy to empathise and be motivated to action by the sight of larger animals getting tangled in pieces of larger plastic, and maybe this is enough to get society to start caring enough to come up with solutions to the problem. However, it is also important to be aware of the invisible threat. People should not care any less, just because it is not as gory as the wounds of oil spills or the traumas of meso- and macro-plastic pollution, about the complicated microplastic infection gnawing underneath the surface of our oceans. “What are Microplastics?”, Ocean Facts, National Oceanic and Atmospheric Administration, last modified June 25 2018, https://oceanservice.noaa.gov/facts/microplastics.html. Anthony L. Andrady, “Microplastics in the marine environment” Marine Pollution Bulletin 62, no. 8 (August 2011): 1596-1605, https://doi.org/10.1016/j.marpolbul.2011.05.030. Albert A. Koelmans, “Modeling the Role of Microplastics in Bioaccumulation of Organic Chemicals to Marine Aquatic Organisms. A Critical Review”, Marine Anthropogenic Litter pp 309-324 (2015). In: Bergmann M., Gutow L., Klages M. (eds) Marine Anthropogenic Litter. Springer, Cham. https://doi.org/10.1007/978-3-319-16510-3_11. Matthew Cole, Pennie Lindeque, Elaine Fileman, Claudia Halsband, Rhys Goodhead, Julian Moger and Tamara S. Galloway, “Microplastic ingestion by Zooplankton”, Environmental Science and Technology 47, no. 12 (2013): 6646-6655, https://doi.org/10.1021/es400663f. Stephanie L. Wright, Darren Rowe, Richard C. Thompson and Tamara S. Galloway, “Microplastic ingestion decreases energy reserves in marine worms”, Current Biology 23, no. 23 (December 2, 2013): PR1031-R1033, https://doi.org/10.1016/j.cub.2013.10.068. J.C. Antunes, J. G. L. Frias, A. C. Micaelo and P. Sobral, “Resin pellets from beaches of the Portuguese coast and adsorbed persistent organic pollutants”, Estuarine, Coastal and Shelf Science 130, (September 20, 2013): 62-69, https://doi.org/10.1016/j.ecss.2013.06.016. GESAMP “Sources, Fate and Effects of Microplastics in the Marine Environment: Part 2 of a Global Assessment” (London: International Maritime Organisation, 2016) 60 http://www.gesamp.org/publications/microplastics-in-the-marine-environment-part-2. Miriam C. Goldstein, Marci Rosenberg and Lanna Cheng, “Increased oceanic microplastic debris enhances oviposition in an endemic pelagic insect”, Biology letters 8, no. 5 (November 30, 2011): 817-820, https://doi.org/10.1098/rsbl.2012.0298. Tim Kiessling, Lars Gutow and Martin Thiel, “Marine Litter as Habitat and Dispersal Vector”, Marine Anthropogenic Litter 181-141 (2012). In: Bergmann M., Gutow L., Klages M. (eds) Marine Anthropogenic Litter. Springer, Cham. https://doi.org/10.1007/978-3-319-16510-3_6. Richard Thompson, “Marine debris: are there solutions to this global environmental problem?” Filmed at the Marine Biological Association, Published 16 November 2016, video, 1:02:03 https://www.youtube.com/watch?v=F3zfCrEQXwc&t=12. 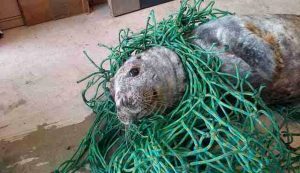 Scottish SPCA, April 15, 2016, available from https://www.thedodo.com/seal-untangled-from-net-1731663721.html. 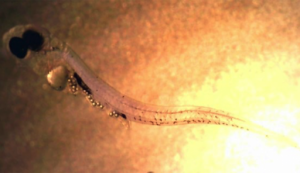 Oona M. Lönnstedt [CC BY-SA 3.0], “Microplastic particles influence in Perch Larval”, January 3, 2016, https://commons.wikimedia.org/wiki/File:Microplastic_particles_influence_in_Perch_Larval.png. Petty Officer 1st Class Michael B. Watkins, “Oil from the Deepwater Horizon oil spill approaches the coast of Mobile, Ala.”, May 6, 2010, https://commons.wikimedia.org/wiki/File:Defense.gov_photo_essay_100506-N-6436W-023.jpg. Jamie is in his last year at Radley College and hopes to study Biology next year at university. 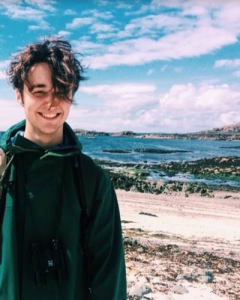 In Biology he finds issues to do with ecology and conservation particularly exciting, and how to manage the relationship between humans and nature. He has a particular interest in how scientists can communicate their work to the public. In his spare time Jamie enjoys playing guitar and writing poems. This is brilliant. This needs to be read and understood by all.